Filmmaker Andrew Jarecki examines the complicated life of reclusive real estate icon, Robert Durst, the key suspect in a series of unsolved crimes. THE REVIEW: When I saw All Good Things about two years ago, I came out of the film intrigued by what I saw but questioning the validity of the story “based on true events”. Now having seen the new HBO documentary miniseries from director Andrew Jarecki (who also directed All Good Things), I’m even more intrigued by Robert Durst’s story and no longer find myself questioning how the story fits together, but rather why Robert Durst did what he did (allegedly or not). Something I find interesting is that, while my review for All Good Things is positive, I don’t remember much about the film. Not the performances (which I highly praised), the structure (which I disliked), or the plot points. I can think of several reasons why this might be, the most probable one is my lack of knowledge going into the film. Before All Good Things I had not heard of Robert Durst, the disappearance of his wife, or the two murders to which he has been linked in the decades since. Combine that with a film that gives all the characters different names — Robert Durst is David Marks — and I likely didn’t connect the dots and therefore lost interest soon after watching the film. What makes The Jinx so memorable and unlikely to be forgotten, is how jarring the storytelling is. Andrew Jarecki structures the six episodes in such a way that increasingly builds a case, much like the police or lawyers would do. You begin episode one, “A Body in the Bay”, fairly open-minded. Robert Durst isn’t even introduced until the end of episode one and we don’t see interviews with him until episode two, “Poor Little Rich Boy”. Even as Jarecki mounts a case and presents the relevant facts to the story, it isn’t obvious whether Robert Durst is guilty or not. There’s a lot of strange occurrences and inconsistencies in his story — more than enough to warrant further investigation — but guilty vs. not guilty isn’t apparent right away. By episode four, “The State of Texas vs. Robert Durst”, the episode where we see Durst’s 2001 trial for the murder of his Galveston, TX neighbor Morris Black, that our opinion as the audience solidifies. As one of the interview subjects says, “There’s too much smoke for there not to be a fire.” With all the evidence, it seems pretty apparent that Durst was complicit in the disappearance of his wife Kathleen Durst, and the murders of Susan Berman and Morris Black. He even admits to killing and dismembering Morris Black but the jury found him not guilty because his lawyers argued it was in self-defense. The real kicker is of course the finale, “What the Hell Did I Do?”, and the shocking revelation that comes at the end when Andrew Jarecki confronts Durst with some pretty damning evidence. There’s also the added benefit that a day before the final aired, on March 14, 2015, Robert Durst was arrested on a first degree murder charge in connection to Susan Berman’s death. It is crazy for a show to cover an unfolding drama as a similar one plays out in parallel in real life. 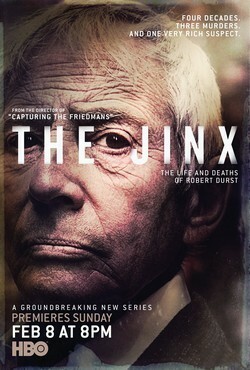 In a way, The Jinx is not just documenting Robert Durst’s life but is also writing the next chapter in his story. What Andrew Jarecki and the filmmakers find directly influences the outcome of the miniseries. This is one of the criticisms of the show as people have questioned how long Jarecki held onto evidence and using it to further their show (rather than furthering the Los Angeles Police Department’s criminal case against Durst). THE TAKEAWAY: Whatever you may think of the filmmaking tactics Andrew Jarecki and others used to get The Jinx on screen, in particular the revelatory and stunning finale, the end result is one to marvel at. The build-up and reveal of key facts allows room for doubt early on, but crushes it soon thereafter. It paints a compelling case against Robert Durst, one which a defense attorney would have a hard time fighting. Perhaps there are explanations for all the inconsistencies and questions raised by Durst’s actions. Perhaps he is not responsible for his wife’s disappearance as he steadfastly proclaims. Perhaps Durst is not guilty, but after watching The Jinx I find it very unlikely.